There's no denying that your Dad is one of the most significant and influential people in your life. You can tap into his wealth of knowledge, both on personal and practical matters, on a regular basis - just by asking the right questions. This is one of the most common questions to ask your Dad as, to be honest, some people just don't have a clue when it comes to fixing things around the house. Dads are a really good resource when it comes to practical DIY questions - and they almost always know the answers. They say that the best way to figure out where you're going is to assess where you came from. As you get older, your memories fade and you forget the essential experiences you had from childhood. Get to know yourself better by constantly asking your Dad what you were like as a child, what your interests were, and what your hopes and fears were. Not only is this useful information for you to know for personal development, but it's also fun for you and your Dad to reminisce. Whether it's health, car or some other form of insurance, dads are the kings of knowledge when it comes to insuring your assets. After all, dads have been on this earth a fair few extra years than you and have had to try many different types of insurance with a wide range of companies. They've got some sneaky little inside knowledge when it comes to insurance, so make sure you use it to your advantage. As well as the practical stuff, dads are great when it comes to love life advice. If you're ever having trouble with your other half, go and speak to your Dad about it. One of the most difficult questions that you will have in life is how to know whether your other half is the one you should marry. They say you should just know - but, if you're unsure, why not ask your Pops? If it's one thing that dads are sure to have an opinion on, it's sports. Most dads are into sports, even if it's just a little bit. In fact, most dads are not just into sports - they're absolutely obsessed with them. Whether it's football, basketball, baseball or bowling, your Dad will certainly help you figure out which team you should support. It's likely you'll have been told from a young age anyway. If you want some real insight into your family, ask your dad about his childhood. Ask him to tell you about his relationships with his siblings, his parents and his hometown. Looking at your grandparents or aunts and uncles through your dad's eyes is incredibly eye-opening in terms of explaining family dynamic. 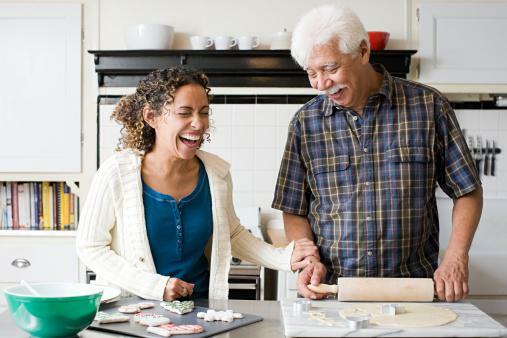 Holidays are all about family celebrations, but what are you Dad's favorite traditions? Does he love getting the house decked out in Christmas lights or does he love celebrating July Fourth with a grill going in the backyard? This question becomes more important as you get older and have a family. Incorporating your Dad's favorite traditions into your family's traditions can help strengthen the bonds between you, your children and your Dad. As you grow up, you start to figure out your priorities in life and what you want for yourself. Whether you're planning on having children, or you're completely unsure and need guidance, your Dad can use his expertise in this area to fill you in on what it's like to be a parent. This will help you make a better, more informed decision in the long run. Then, if you do end up having a family, you can ask your Dad's advice on anything and everything when it comes to how to raise a child. Your Dad has watched you grow, helped you make tough life decisions, and he was around when you made bad decisions. It's always good to check in with your Dad every now and then to let him know what you're getting up to and let him offer you parental advice. It's nice to know you're on track and you're living a life that does you justice, coming from someone who knows you best. All you want in life is your parents' approval. You want them to be proud of the child that they raised. You want to be reassured that you're doing well in their eyes and have it reiterated to you how much that they love you. That's why this is the most important question of all. There's nothing like a parent's love. Whether you're close with your Dad, or you only see him once in a blue moon, your relationship with him is one of the most important relationships you'll ever have in your life. Enjoy your time with your Dad, share your stories together and ask him significant questions while you can - because life is short, it's precious and you've only got one shot at this.